It's time for you to have total control over your front door, from anywhere. 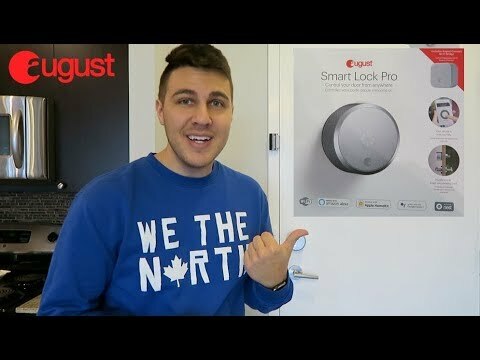 The August Smart Lock Pro is the leading Z-Wave Plus retrofit smart lock. You can lock and unlock your door, create virtual keys for guests, and keep track of who comes and goes with a 24/7 activity log, all from your iOS or Android smartphone. The August Smart Lock Pro features Z-Wave Plus and BLE and it is the only lock to support the three leading voice-assistants, Siri, Google Assistant, and Amazon Alexa. The lock quickly installs on the inside of your door with just a screwdriver. Keep your exterior door hardware exactly as it is and use your traditional key any time. Included Wi-Fi bridge lets you operate and check your front door from anywhere. Be sure your door is secure with DoorSense™. Always know your door is both closed and locked. Automatically locks your door behind you, and automatically unlocks when you get home. Easily attaches to your existing deadbolt and installs in minutes with just a screwdriver.